Advantages: Compact and useful format for modellers; broad coverage of French WWII subjects packed with photos; inexpensive; attractive cover art - front and back. Recommendation: Recommended to anyone wanting a succinct and inexpensive introduction to French WWII fighter aircraft..
By 1938, the French Armee de l'Air recognised the vulnerability of their underequipped and obsolete fighter force in comparison to Germany's growing Jagdwaffe. French plans to upgrade the equipment and organisation of the Armee De l'Air was underway in 1939, but was diverted by the German invasion of Poland and ultimately curtailed following the French defeat in 1940. French fighters early in the Second World War comprised an interesting mix of promising designs and some less successful concepts. It would have been interesting to follow the evolution of some of the more successful French fighters had they been permitted the same style of evolution under fire that transformed the Spitfire and the Messerschmitt Bf 109 over six years of war. Each of the types includes a short section on the development, operations and (where appropriate) variants and foreign service. The advantage of this approach is the broad coverage of material in a slim 50 page volume, ideal for modellers with an interest in the general subject. The disadvantage is that the information is necessarily brief. Also, the book has no contents or index page, so the reader must flick through the pages to locate information on particular aircraft subjects. This book otherwise follows Squadron/Signal’s popular “In Action” format with colour cover art by Don Greer, two colour pages as a “centrefold” with ten colour side profiles, helpful line drawings and specifications spread over 50 pages in landscape format. As with the rest of the series, the real backbone of these books are the multitude of photographs packed between the covers. More than 90 wartime images are included in this inexpensive volume. 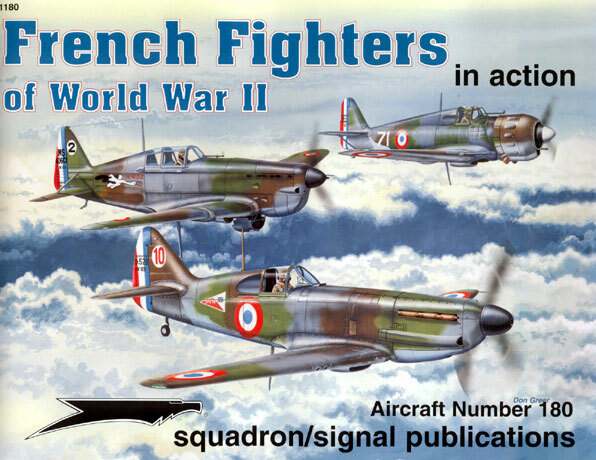 French Fighters of World War II in Action is a good primer on this subject. Considering the variety and extravagance of some of these French designs and their markings, the subject has barely been covered in the English language. Recommended to anyone wanting a succinct and inexpensive introduction to French WWII fighter aircraft..